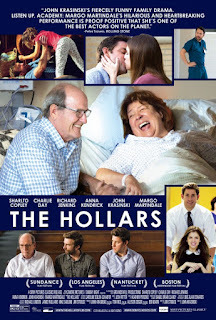 The indie comedy-drama THE HOLLARS belongs to a familiar category, the homecoming film, in which a person is plucked out of adulthood and forced to return to the family homestead, there to deal with all manner of dysfunction. Graced by a superior ensemble and flecked with humor and tenderness, it has the look of a winning film and would be, if not for problematic plotting and a weakness for wacky laughs. Our returnee is John Hollar (John Krasinski of The Office fame, who also directed), a graphic artist living in Manhattan. He's wavering about marriage, even though his girlfriend, Rebecca (Anna Kendrick), is conspicuously pregnant, and he's dissatisfied with his job at a publishing house (he aspires to be a graphic novelist.) John learns that his mom, Sally (Margo Martindale) has been hospitalized after collapsing at home. Rebecca puts John on a plane to his hometown. Sally is diagnosed with a brain tumor and must undergo surgery. Her husband, Don (Richard Jenkins), is an emotional wreck. His business is failing and is facing bankruptcy. His older son, Ron (Sharlto Copley), is living in Sally and Don's basement after being fired from dad's business and divorcing his wife. Ron, who has two daughters, isn't handling the divorce well. In a funny scene, he drags John along while he parks outside his ex-wife's house and peers into her windows with binoculars. The pair are confronted by the ex-wife's surprisingly understanding boyfriend, a youth pastor played by Josh Groban. The movie was written by James C. Strouse, whose previous outing, PEOPLE PLACES THINGS, this strongly resembles (struggling graphic novelist with relationship problems, issues related to divorce and child custody). There is enough incident for a sprawling intergenerational novel, uncomfortably crammed into a 105-minute movie. Strouse and Krasinski don't seem to trust the heartfelt narrative, so they resort to ridiculous happenings: Ron peeing into a juice pitcher because both home bathrooms are occupied; Ron and his dad having a slap fight; John kidnapping his mom from the hospital on the eve of brain surgery and taking her for burgers and ice cream; Rebecca, in labor, being rushed to the hospital in a hearse. And so on. Martindale, a justly acclaimed actress, is affecting as the steady matriarch. A scene that has her expressing her terror of surgery is chillingly real. Copley, a South African actor, brings a battered sadness to Ron, who so misses his young daughters that he climbs into their bedroom window and cuddles them overnight. But whenever there's a moving moment, the movie undermines it with some amped-up absurdity, as if it's afraid to let us cry. Sally, about to be wheeled into surgery, cries out in fear, and her family soothes her by serenading her with her favorite song. Something generationally appropriate for a mature grandmother? Nope, it's “Closer to Fine” by the Indigo Girls, a song whose complex feminist lyrics I doubt are on many grandmas' and grandpas' lips. The screenplay makes wan attempts to flesh out the characters, but they remain stubbornly superficial. Sally confides in John that she sometimes regrets marrying Don, but she never reveals why. She reminisces about their early married days, when she used to sit for hours in an empty movie palace, staring at the elaborately painted ceiling. Why the ceiling, for heaven's sake, and not the movies? The anecdote reveals nothing about Sally, her marriage, or her dreams. We don't expect absolute verisimilitude in fiction, but a story should have people behave plausibly. The medical content of this story is particularly problematic. When someone is diagnosed with a brain tumor, might not the first question be whether it's cancer? The issue never arises. THE HOLLARS has some excellent qualities, especially its cast, but it should have been so much better. 2 3/4 out of 4 stars.